JT – In recent IndyCar events, Simon Pagenaud dominated at Phoenix, taking his first win on an oval. Really, Penske as a whole was strong as were the Chevrolet cars in general. Seven of the top ten finishers were in Chevys. Scott Dixon must have been fairly pleased to be the best of the Hondas with his 5th place finish. More recently Scott finished 2nd in the Indianapolis Grand Prix, the prelude to the Indy 500. He was the best of the Honda finishers, bested only by Chevy-powered winner Will Power. But the big news as we count the days until the Indy 500 is that Scott put in four fantastic laps at the Speedway to win his third Indy pole at 232.565 mph! SJ – Getting the pole at Indy again is great obviously, and it was a mighty run from Scott for sure. Indy qualifying is not easy under any circumstance. But to go out cold without even one lap in practice all day – he went straight from qualifying on Saturday to qualifying on Sunday – in a car that you have no idea about in terms of how it will perform, that’s impressive. Everybody is trying to trim their cars to the absolute limit and I think Scott and his engineer Chris Simmons went all out this time. Scott said he had a small breather in turn 2 every lap just keep the front tight and he was still doing 232 laps so the car must have been extremely light on downforce. Typically, if you have to lift anywhere on the four lap run the time won’t hold up. JT – Last weekend’s action at the Speedway proved again that nowhere else is qualifying for a race more dramatic than at Indianapolis. SJ – Indy is fantastic, the whole format, the build up and the process, everything is just magic. It’s so exciting both for the fans and the competitors. There’s nothing that comes close to it really. It’s a very special place. It’s a pity there’s not enough cars for bumping as there used to be, that was almost more exciting than the fight for pole many times. But the format is great, and the crowd was fantastic this year, you could even hear the roar on the TV when the guys were posting the big laps. Great stuff! 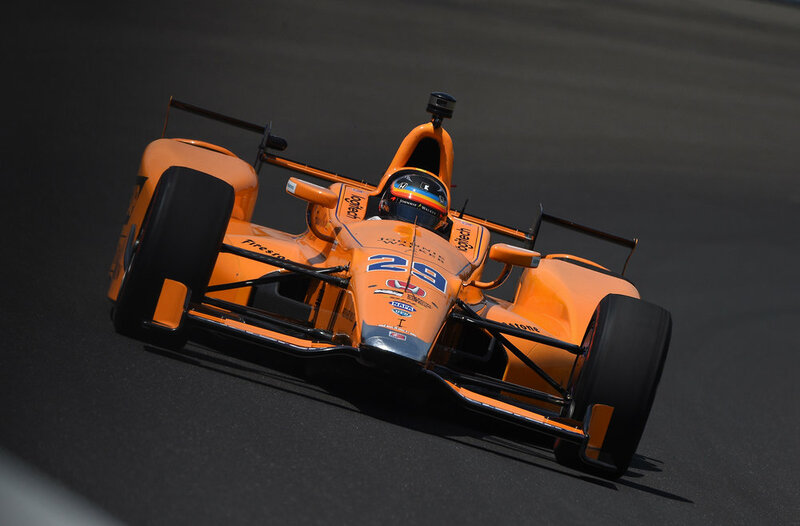 With Alonso being there this year as well, I think a lot more people that normally would not tune in are going to realize again how incredibly exciting it is and how great IndyCar racing and the Indy 500, in particular, are. It’s an outstanding event and qualifying is really an event in itself, apart from the race. Alonso also mentioned that he wants to be a “complete driver” which I think is fantastic coming from him. I think his involvement this year could start a trend. I’m sure he’s loved every minute of this experience so far. Attendance for the race this year could well be the biggest yet. It will for sure be the biggest crowd Alonso has ever raced in front of. It’s the biggest crowd anyone ever races in front of period. The whole experience is totally exceptional. I remember the first time I raced there, walking out onto the grid for the first time after having been there all month and it’s amazing. Qualifying has a pretty good crowd but when you walk out onto the grid on Sunday morning before the start you suddenly see this mountain of people in front of you. I get goosebumps just thinking about it. It’s an incredible experience. JT – Does the massive crowd distract you during the race, as opposed to practice when the seats are basically empty? SJ – It’s different. You get in the car on race day and there are all these people and you find that the track has suddenly shrunk. Your view peripherally is completely different. The track feels like it’s half the size compared to what it was when the stands were empty. It’s kind of bizarre and it takes a few laps to get used to. You just have to readjust. You have visual reference points and you just have to adjust them a bit. If you’re running in the middle of the pack during the race - or in the last 500 I raced in where I started from the back row because I qualified on Bump Day and I bumped the Penske’s out of the race – when you’re behind all these other cars, and because they’re running on ethanol you literally can’t see anything the first three laps. Your eyes are watering so much, just dripping from the exhaust fumes. They’re so strong and the smell is just insane. Then there’s the turbulence. The whole car is just dancing around all over the track. You’re basically hanging on for dear life before the field gets strung out a bit. And back then, going into Turn 1, you couldn’t even hold your head straight. We didn’t have the head rests they have now and your helmet was bouncing around all over the place which also prevented you from seeing a damn thing. JT – Four of the five Andretti cars made the top nine with the fifth in the 10th starting position. Scott’s on pole with Tony Kanaan 7th for Ganassi. Only one of Team Penske’s drivers made it into the top nine, Will Power. This is a bit puzzling given Penske’s typical performance at the Speedway. SJ – Yes, this is highly unlike Penske. They go for it big time in qualifying normally. I don’t know if they’re struggling to find speed or what their issues were. We’ll find out on Sunday. Qualifying is a different deal though, just because you can’t find the ultimate speed in Qualifying, that doesn’t mean you won’t have a quick race car. The other thing is that at Indy more than any other track the cars are very sensitive to any changes in track conditions. If the wind direction or speed changes or the temperature goes up it can very quickly go from a perfect car to one that is nearly undriveable in a matter of a few laps. This is why you often see someone that starts upfront going backwards very quickly. Every team is spending as much time as they can running in every possible condition during practice to gather as much data as possible for race day. JT – Getting back to the Indianapolis Grand Prix and the race at Phoenix, what did you make of those two? SJ – I think Scott did extremely well to finish in 2nd in the Indy Grand Prix. I think the differences in the Honda and Chevy aero kits definitely gave the Chevys an advantage drag-wise in both those races, but then Honda clearly have an advantage at the Speedway so one outweighs the other I guess. Whatever the intent was when IndyCar set out to have manufacturer-specific aero kits, I think it’s really kind of backfired. For the Indianapolis Grand Prix, Chevy had the edge. For the 500, it’s obvious that Honda has an advantage. Then again, the Chevys have a big advantage at Phoenix and other short ovals. So the performance is not really equal for one or the other manufacturer depending on where you go. Chevy and Honda had to submit a finalized aero kit at a certain date in the past and that’s it. They’re both stuck with what they have. That’s not really a proper way to determine a championship or even the outcome of an individual race. So whatever IndyCar’s intent was, it hasn’t worked out to be what they envisioned. I think you have the manufacturers do the engines and you have a spec car or you free up the rules and let the designers and teams do what they want to do. It’s so hard to regulate these things fairly, which is what will happen from 2018 onwards, and how it was before this latest aero experiment with different body kits for each manufacturer. It’s the same with all these BoP (Balance of Performance) formulas and with driver ratings we have to deal with in Sportscar Racing. Trying to regulate these things rarely works out well. I still firmly believe that it should be an open competition and may the best man win. We kind of knew Phoenix would be a problem for the Hondas since before the season started. I think Scott’s happy with his finish – you know, best in class and good points for the season (Dixon is now 2nd in points behind Pagenaud) – there’s not much more he could have hoped for there. JT – The Spanish Grand Prix at Barcelona was the most recent F1 contest. Again, it wasn’t the most scintillating race. 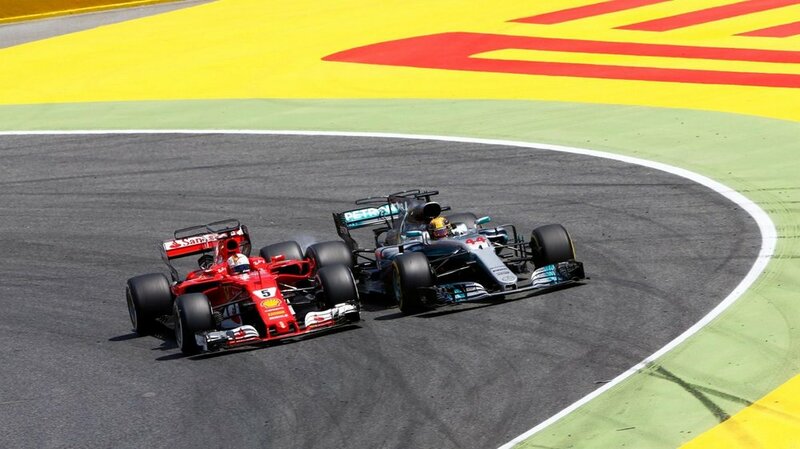 In summation, it seemed that Sebastian Vettel won the race at the start going into the first corner and then Ferrari’s pit strategy lost the race, allowing winner Lewis Hamilton to gain massively on Vettel. Further aid came when Hamilton’s teammate Valtteri Bottas held Vettel up behind him. When Stoffel Vandoorne collided with Felipe Massa in Turn 1 on the 34th lap, a Virtual Safety Car period ensued. Mercedes pitted Hamilton for soft tires but Ferrari left Vettel out. That seemed to be a tactical mistake. Do you agree? SJ – Yes, I would agree with you. It boggles my mind why Ferrari didn’t stop when there was a VSC. That’s race strategy-101. If you have a virtual safety period and you’re in a pit stop window, you have to stop. I am not 100% clear if the pits were closed during the safety car period or not, in which case maybe Vettel passed the pits as the track went green and Hamilton being 8 seconds behind was able to duck in just as Vettel passed the green flag. It’s fantastic that the championship is so close and we now have two teams fighting for the title. And it’s great that Ferrari is one of them. Kimi had bad luck at the beginning, getting taken out on the first lap when he was nudged by Bottas into Verstappen. I think Verstappen’s move trying to go three wide on the outside was a pretty low percentage move. The chances of pulling that off were pretty small but I can also understand him trying as that would be his only chance of passing the guys in front as it’s virtually impossible to pass anywhere on that track under normal racing conditions. JT – The Russian Grand Prix had a somewhat surprising result. Mercedes GP’s Valtteri Bottas won with Ferrari’s Sebastian Vettel and Kimi Raikkonen finishing 2nd and 3rd. Lewis Hamilton finished off the podium, having struggled all weekend. Bottas had a terrific start from third position on the grid, passing both Vettel and Raikkonen to take the lead into the first corners. He led the rest of the way and drove well. His only test came from Vettel who closed on him in the final laps. But Vettel was never close enough to challenge Bottas. Otherwise, there was almost no overtaking in this processional race. What did you make of it? SJ – The race was more or less what we’re used to seeing but I thought Bottas did a terrific job. He had a great start and was under a fair bit of pressure at the end and stayed cool and calm to win his first GP. There wasn’t any passing but it’s the same thing we’ve been talking about for a long time now. More downforce never makes racing better and unless there are some sort of freak circumstances this won’t change until they either change the philosophy on the car designs or re design the tracks to make them more challenging so that drivers will occasionally make a mistake or simply make it possible for a more skilled driver to take a corner faster and by doing so being able to pass. JT – Ferrari locked out the front row after qualifying in Russia and now seems able to match or exceed Mercedes’ pace over a lap depending on conditions. It’s a marked improvement for them. SJ – I really think one of the key ingredients there is what I’ve said for months now. Vettel made the effort to be an integral part of Pirelli’s tire testing and development program for 2017. None of the other top guys made that commitment. The other teams can say what they want about the testing being done with an old and different car but it doesn’t matter. It’s the feel of the tire that matters as much as the grip for most drivers. If you can influence that feel from the tire to get it to where you’re comfortable with it, that makes an enormous difference. The tires are the one area where you can gain or lose a massive amount of performance. Vettel has helped Ferrari get the car dialed in with the tires. And that’s where Mercedes and maybe even more Red Bull is struggling at the moment. They didn’t test the new tires with their regular guys as much and that’s in my opinion why they’re now struggling to make the car work. JT – In other F1 news, Force India continues to impress, holding fourth in the championship behind the big three teams with double the points of Williams F1, their closest mid-pack rival. Meanwhile, Haas Ferrari has been struggling, suffering brake problems and a car which alternately suits one driver or the other but not both. At the absolute bottom of the grid are McLaren Honda and Sauber Ferrari. Neither team has scored a point yet and McLaren has had only one finish over the opening four rounds of the championship. Ironically, the two are now linked with the recent announcement that Sauber will use Honda engines in 2018. What are your thoughts about these developments? SJ – Force India has been quite impressive. They’re definitely punching above their weight so far, similar to how they performed last year. Haas keeps having brake problems. It’s a bit mysterious but on the other hand the braking systems today are so complicated it’s not too hard to imagine. Sauber switching to Honda is interesting. I guess it’s a financial matter as much as anything. I personally think Honda will eventually get their engines right. It’s just a matter of when and how. If the engine formula remains essentially the same and they have enough time, there’s no doubt they’ll fix their problems and become a factor again. And at this point it’s far better for McLaren to have another team running Honda engines to share the development load. Plus, Sauber isn’t exactly going to be a threat to McLaren. McLaren’s agreement with Honda did prevent Honda from supplying other teams and that hasn’t been helpful but I guess you could say that no one expected Honda to be as far off as they have been either. JT –Up next for F1 is the Monaco GP. In contrast to Indy where both qualifying and the race are important, qualifying is perhaps more important than the actual race at Monaco. SJ – Qualifying is definitely the thing that really matters at Monaco. Unless there are freak circumstances during the race with rain or something like that and there are strategy calls they can’t plan for comes into play, not too much changes after qualifying positions are established. Otherwise, we’ll see the usual procession we are used to. The race is pretty much over after the first corner all things being equal. Even with the Formula E race there a couple weeks ago which uses only half the track, it was virtually impossible to pass. There’s really only one line around the entire track. Even if you get a run on someone coming out of a corner there’s really nowhere to go. You follow one line which applies to the entire track. There just isn’t one single spot which is really an overtaking place. JT – The New Year is underway and as the Rolex 24 have just kicked it off, we begin another season of the #SJBLOG. We’ll continue to discuss all that is fun, fantastic and occasionally frustrating on the global racing stage. We invite you to join us for what should be a very interesting year in Formula One, IndyCar, sports car racing and more. Bernie pushed the series forward to new heights and is the one person most responsible for what F1 has become in the modern era. 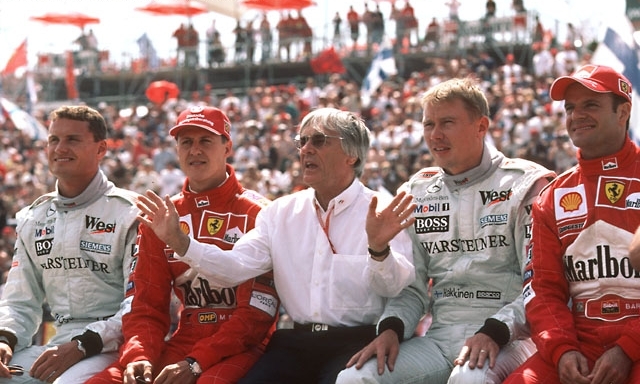 He also the only leader the overwhelming majority of the F1 paddock has ever known – a figure central to the environment in which teams, drivers, circuits and manufacturers have functioned for decades. What are your thoughts on Bernie’s exit? SJ – Well, it was to be expected of course with the new ownership but it’s still a very major end of an era. Since any of us can remember Formula One has been synonymous with Bernie. It seems like nothing in modern times in almost any capacity has ever happened without his involvement. Teams, drivers, promoters, TV, you name it – every little detail and every brick in that business has been laid by him. It was a weird feeling when I first heard of the announcement and talking with other friends from Formula One it seems that everyone agrees that it’s kind of sad, he’s been like a grandfather to all of us. The change is definitely a big deal. I can’t think of anyone in the paddock now who was there before Bernie. It will be very interesting to see what happens. Personally I feel that Liberty might have been better off by keeping Bernie on-board for a few more years and ease into the ownership by learning or studying how things got done rather than cutting the cord and starting with a clean sheet right away. If I had the opportunity to work next to what is arguably one of the best deal-makers in history, not only in F1 but in general, I would certainly jump at the opportunity. The devil is always in the detail and Mr. E was the only one in that organization that had an intimate knowledge of every little detail. Those are some big shoes to fill for sure. JT – Indeed they are. Liberty Media has a fairly impressive team. Chase Carey is now CEO while ex-ESPN executive Sean Bratches will direct the commercial side of the series. Ross Brawn returns to F1 with Liberty in charge of the sporting side of the series as managing director, motor sports. SJ – I think it’s great that they’ve gotten Ross involved on the technical and sporting side. You couldn’t find a better guy as he’s probably the only designer or engineer that also has a very clear and deep understanding of the business side of F1. Hopefully he will be able to simplify many of the things that have gotten far too complicated over the past years. On the other hand, there’s been a lot of talk that everything needs to change. But I don’t think anyone really has the answer whether it’s on the digital side, the sporting side or the commercial side. What is the actual answer to all of this? It may be easy to recognize what’s wrong but fixing it all is something else. That’s the critical part going forward. I’m not underestimating the people at Liberty Media. They’ve been extremely successful in everything they’ve done. And they’ve have already been smart enough to surround themselves with good people so one would hope that the right decisions will be made. But I believe F1 is at a stage right now where if you make another two or three wrong decisions in important areas I don’t know how much longer it will be interesting or relevant for the fans - or for the teams too for that matter. Aside from the manufacturers, every team is on the limit financially already. With new rules again for this year the costs will certainly not go down, most likely they will increase yet again as all the teams had to start with an almost clean sheet as far as the chassis go. How do you control the costs? There are so many different aspects and at the same time you may not want to do too many things. Ross has already talked about a 3-5 year plan on the technical side, and that’s a good sign for sure. But then there’s all the other commercial aspects of the business that needs to be dealt with. I don’t think anyone truthfully has the correct answer or the right way forward in this area simply because things are changing at such a high rate today. It’s very tricky to say the least. All sports are dealing with the same problems, people were quite happy to sit through a 2-3 hour sporting event in the past, because it was the only game in town, not so anymore, except for the very big events like the Superbowl or the Soccer World Cup for example. JT – Chase Carey made the comment that he wants every race to turn into a “Superbowl” with the event starting the week prior to the Grand Prix. Do you think there is enough interest in some of the markets to make this work? SJ – We have two very definite Superbowl equivalents in Motor Racing already, the Indy 500 and the Le Mans 24 hours, they are both massive events. Monaco probably falls into the same category although they can’t pack in the same amount of people due to the sheer size of the venue as they do at Indianapolis in particular. I don’t know how well they have studied each individual market but in some other places it is already like a Super Bowl kind of atmosphere. The build up is starting very early and the entire City comes alive when the GP comes into town. Montreal for example is a great example of this, there’s an incredible atmosphere there, Singapore, Monaco and some others too. But there is generally a common denominator in all these cases and it’s the location of the track. If the track is located in a major city or very nearby it sort of just happens organically. But, when you have to drive for an hour or more and the hotels near the track are spread over a 100 mile radius it’s difficult to get a Superbowl atmosphere because there is no focal point. And this is the problem with a lot of the venues on any racing calendar. Indycar is exactly the same, all the city races are huge, with large crowd and great atmosphere. As for the TV numbers I am not sure they would get anything close to what they have for the Super Bowl if there was one every two weeks in F1. It’s a completely different thing and maybe that’s partly what’s lacking in F1. Monaco is for sure more prestigious to win than any other Grand Prix, but it’s nowhere close to Indianapolis or Le Mans in terms of the amount of spectators or the build up beforehand. JT – In comments earlier this week, Liberty commercial chief Sean Bratches outlined four areas that the organization will prioritize to improve the sport. The third concerns the approach Liberty will take to managing the series. “The third is creating a much more democratic approach in terms of how we approach our partners – from teams/sponsors/promoters and rights holders. There is a lot of opportunity to leverage the F1 IP to integrate it to their businesses,” Bratches said. Given the view you’ve often expressed about the inefficiencies that result when F1 is ruled “by committee”, what do you think of Liberty’s notion of a “much more democratic approach”? SJ – If you look at any championship that’s been run like a democracy, it’s failed. I think that’s true of most sports in general. I think there will be so many opinions that, again, it will be hard to get things done. But this is the “romance period” for the new establishment. We’ll see how it goes. Since F1 implemented a somewhat more “Democratic” approach through the Strategy Group there seems to be more confusion and more complicated rules every year. So far, they have not accomplished anything that has made F1 better as far as I’m aware. I absolutely think they need to get away from this Democratic approach and instead put together a small team of individuals that are highly respected by their peers, that understand the different aspects of the business and are completely independent from the pressure of running a team or promoting a race or anything else that will give them a biased view of how to run the business. You then need to let them get on with formulating a plan to go forward. If they let everyone have their view on every single matter it will end in disaster just as we’ve seen in so many other series and sports for that matter. I don’t think the guys at Liberty has any idea of what’s in store for them when it comes to dealing with the teams in particular. The best analogy would be to use the famous quote from Ron Dennis when Eddie Jordan entered F1 back in the 80’s, “Welcome to the Piranha Club”. Nothing has changed since then and that is exactly what they can expect. JT – Drivers have now started to opine that the new 2017 cars will not only be faster but much more physical to drive with higher loads to be withstood. That’s why many have said they have stepped up their off-season physical training. In addition, many including current and former drivers are finally acknowledging what you spoke out about half a year ago - namely that the increased downforce of the 2017 cars may actually make passing even more difficult in F1. SJ – Unless I’ve completely missed something, I can’t see how the new cars will make the racing better. I’d love to be proven wrong, seriously, but I don’t understand how it’s possible. It was already difficult enough to pass in recent years because braking distances are already so short. With the current cars they are almost in the corner when drivers hit the brakes. They are now talking about a 40kph increase in cornering speed with most likely even slower straight-line speeds due to increase in drag from the added downforce, which means they will literally be in the corner when they brake. Unless I’m mistaken, braking into a corner is generally where most passing takes place, unless you’re on an oval track and you can run multiple lanes. Maybe these cars will have so much grip that they can run two lanes. That’s the only way I can see any passing happening. Your exit speed from a corner will be completely irrelevant because, relatively, there will be so little acceleration taking place with a 40 kph higher exit speed on average. That means your acceleration will be even less than currently from corner exit to the end of a straight. Apparently the FIA has already informed the track owners that they will have to modify the run off areas in some places due to the increase in cornering speeds. In fact, what is happening is that the cars have now outgrown nearly every track. With such an increase in grip and cornering speeds there is virtually not one challenging corner left on the calendar. The engineers are already talking about several corners or sections on many of the tracks being straights, as in there will be no lifting or braking as it used to be before. For example, I expect Eau Rouge at Spa to be flat on the second lap out in first practice, it will literally hardly be a corner anymore. The only place where a driver will be able to make any difference in the lap times will be in the low speed corners, and it will be even more about technique and just hitting your marks than it already is. Bravery and being able to “hang it out” won’t enter into the equation anymore. JT - All this talk about the drivers having to be super fit this year, what are your views on that? SJ - I don’t think it will be anything near as hard as everyone thinks or is talking about. By the time they get to the first race they will all have gotten used to it. They’re certainly not going to pull more Gs than what an IndyCar already does on an oval track. And the guys in IndyCar don’t complain too much about that. All of this is completely blown out of proportion in F1 as far as I’m concerned. The other thing is that the Indycars don’t have power steering so they are way more physical to drive than an F1 car will ever be to begin with. In any race car these days you’re literally glued into the seat. The only things that should move are your arms and anything from the knees down and maybe your core to some degree. But your head is literally stuck in one position now because the head-rest surrounds you and you have the Hans-Device. I don’t see what the fuss is all about. When your head was sitting a foot above the cockpit like it used to be, you really had to use your neck muscles to hold it up. Now you just brace against the head-rest and you’re fine. And in F1 it’s still nothing like the oval in Phoenix in an IndyCar for example, where you race with monster Gs lap after lap for 200 laps. And generally speaking I think all drivers today are very fit to begin with, much fitter than they used to be and they have much more sophisticated training methods and better diets. I don’t think we will hear a word about the physical aspect after a couple or races. JT – Valtteri Bottas has been confirmed as Nico Rosberg’s replacement at Mercedes GP since last we talked. Mercedes made quite a few deals to bring him to the team. What’s your view on his potential? SJ – Signing him was the obvious thing to do, I guess. We’ll see how it goes but now it’s time for him to shine and become a real superstar, or fall by the wayside if he’s not able to match or beat Lewis. It’s the same for all of these guys in mid-pack teams. It’s easy to be a kind of underdog and do a great job and be recognized every time you do a good job and succeed. They say you’re “finished” and this and that, and the media is all over you. The team is on you, everybody’s on you all the time. You’ve got to be at the highest level every time you step into the car. I think that will be the biggest eye-opener for Bottas. He is no doubt a super talent but trying to beat Lewis every time out won’t be easy for anyone in the paddock, we have already seen that with Alonso, Button and Rosberg. All those guys are the best in the business. JT – Adrian Newey and Red Bull Racing seem to be more optimistic heading into the 2017 season, declaring that Renault has made progress with its power unit and that the Red Bull chassis - already well developed – will benefit from it. SJ – I think Red Bull will be the biggest challenger to Mercedes. I don’t think the gap to Mercedes will be as big because the huge advantage they’ve had with their engine is getting smaller. I think they’ll still have a slight advantage but whoever gets their new chassis right will be much more competitive with them and I think Red Bull will be very strong. I have a feeling McLaren will catch up quite a bit too. Ferrari is an unknown at this point, I hope they will surprise everyone and maybe the silence from Maranello is a good sign. JT – You’ve said repeatedly in the past that despite all the resources invested, F1 cars all end up looking almost identical even after a rules change. Do you think that will be true this season? SJ – To a large degree I think they will. The window of what teams are allowed to do is so small now that by nature they’ll all end up looking the same. There’s really no room for innovation anymore. They work in such a narrow box that it’s mostly down to the endless tinkering with the details. I noticed from what I’ve seen until now that the complicated front wings will remain more or less the same, which effectively means that any hope of a car being able to follow the car in front close up is no different from before. I thought one of the reason for increasing the aero from underneath the car was to avoid this from happening, but this will not be the case, unfortunately. As long as the main area of performance on the car is aerodynamics it’s inevitable that all the cars will eventually look nearly the same, the air only like to travel in a certain way and that ultimately determines the shape of the car. JT – One thing not yet discussed by Liberty Media is what they might do to control costs in F1. They have proposed more evenly distributing money among the teams but that won’t help much if F1 remains unsustainably expensive. The sums spent by manufacturers, teams, etc in F1 these days are staggering yet no one seems to blink an eye or has the courage to try to control it. How is it possible for this to be ignored? SJ – Yes, distributing money more evenly is fine but when costs are already through the roof it doesn’t help much. And with frequent rule changes you add even more expense. The best way to keep costs down and make the racing more exciting is to maintain rules stability. The ramp up in costs is always at the beginning of a new rules package for obvious reasons as every team has to develop a whole new car effectively. The longer you have the same set of rules the more the lower ranked teams will catch up and the closer the field will be and the costs will eventually drop for all teams as the trade-off between performance versus money spent decreases each year. To make the competition closer and to control costs, more than anything, I think you need to limit what teams are allowed to do with the cars. I firmly believe that you could standardize 50 to 60 percent of the components. That eliminates the need to design, manufacture and build every single component of a car. All those components have to be run and tested, and now with limits on testing it becomes even more expensive as they have to be simulated and tested in different way which adds even more cost. I keep repeating the same thing over and over, the biggest culprit is the aerodynamics. They must figure out a way to minimize the importance of downforce on the car, or at least simplify what you’re allowed to do on the car. I don’t see why they can’t use the same front wing on all the cars for example, issued and controlled by the FIA. No one can hardly notice the difference between any of the cars as it is now, yet they all produce their own front wings at an astronomical cost to each team, with a windtunnel and CFD programs that never ends, literally. It’s a constant 24/7 development war that never stops all year long, to find the tiniest gains. One of the top teams employ a total of 250 staff in the design and engineering department, of which half are aerodynamicists. I am baffled why they can’t all agree on this as a starting point at least. JT – On a lighter note but also a serious one, racing in general is facing an unprecedented level of competition from other sports and new forms of entertainment. As you observe there are lots of distractions and some are a good laugh. 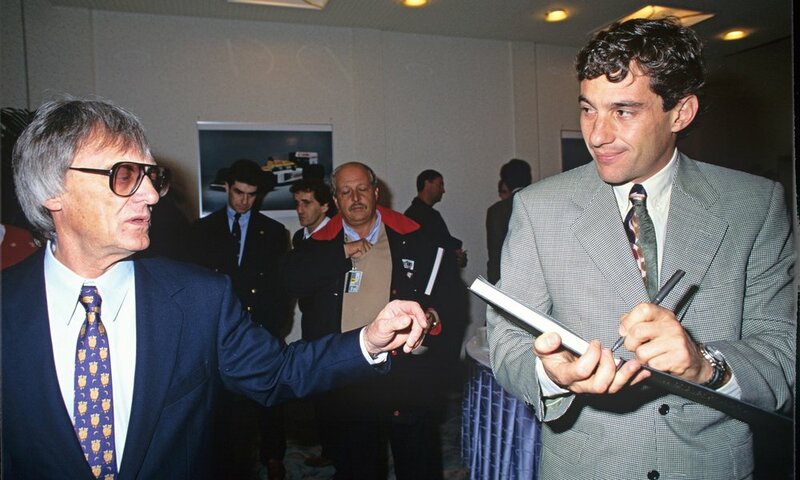 SJ – Fernando Alonso made a comment about the 80’s era recently, saying that people would find it boring nowadays watching those races with Prost and Senna fighting each other. He’s 100 percent right of course. But the difference is that’s all there was back them. People could understand the challenges and dangers, the spectacle. They looked up to the drivers as gladiators and thought it was fantastic. The cars were beasts and fans could see that when they were watching. But the racing was generally quite boring in fact, even more than it is today I would say. Today, there is so much clutter and competition for eyeballs from so many different sources, especially for the younger generations which makes it hard for anyone to sit through a 2 hour race that have very little happening most of the time. Compare that to something as silly as watching these “fail” videos that are so popular now on YouTube for example with these morons from all over the world wrapping their Lamborghini’s and Ferrari’s around a tree or a lamp post, well I hate to admit it but it can be quite entertaining too at times. It’s a silly example and as funny as that is to say, it’s true. And it can be anything. Whatever people are into, there’s instant access to as much as you want – complete sensory overload. So, in my opinion, whatever needs to be done to increase the interest from the younger generation in F1, and racing in general, it has to be something really special. It has to be something really spectacular like F1 is supposed to be, and even more. It can’t be politically correct all the time. It has to be something that people can easily understand as extraordinary and special. F1 isn’t that way at the moment. JT – With the Rolex 24 a new era started in sports car racing with IMSA’s DPi and the global P2-spec. SJ – We’ll see how it all shakes out. The cars at Daytona looked fantastic in my opinion, both the Dpi’s and the LMP2 cars. The racing was good and I think this format could be the way forward for Prototypes in general. Let’s hope the ACO will take a good look at this with an open mind and allow the same type of cars to run the 24 hours too eventually. With only two teams or manufacturers that can effectively win the 24 hours I think it’s time to re-evaluate the entire format for the ACO and the Le Mans 24 hour race. JT – The 2017 IndyCar season is on the horizon. Much of the off-season talk has centered on the series “aerokit freeze” this year and its intention to go to a “universal” kit in 2018, a configuration that may see Indy Cars generating more downforce from underneath the chassis. The move to make downforce from below is intended to reduce turbulence for following cars. What are your thoughts on these moves? SJ – Well, moving to the kit for 2018, even if you try to make downforce from under the car instead of from the top I don’t think it will completely eliminate the problem. You might improve things a bit but you’re still going to have a high downforce configuration. Whatever the ratio is between aero and mechanical grip, you’re going to have a problem if the aero portion is greater than the mechanical no matter what. Right now, the dependence on aero with an Indy Car is probably 80 percent or more. The cars have a crazy amount of grip. If they got rid of a lot of the aero appendages that are all over the cars and cleaned them up it would be a big improvement. I think the best, and only way, to solve this problem for any type of open wheel car is to drastically reduce the downforce and rely more on mechanical grip and more horsepower to get the lap-times to the same levels we have now. This would put the emphasis back on the drivers and car control which is key in my opinion. It’s the same as in F1. Why spend all of this money on aerodynamics when you can have the tire companies give you the grip and engine manufacturers make the engines more powerful? They are both very easy things to do, and at virtually no development cost to the teams or certainly nothing close to what they are spending on their aero programs at the moment. If you had multiple tire suppliers they would duke it out and spend as they used to, to develop better tires. The lap times would drop by 4-5 seconds almost immediately and probably a lot more with time. That would at least have some level of benefit for street tires too as some of the technology is eventually applied to their consumer products. Aerodynamic downforce is about as useful as an ashtray on a motorcycle for anything else but making a race car go faster.